A glowing golden ring that can expand and contrast at Ne Zha's will. It can grow several meters in diameter, to a mere centimeter in diameter. Despite being a ring it is surprisingly sharp when touching an enemy. It can also ricochet endlessly off any object, often at impossible angles. A spear given to Ne Zha by the immortal sage Taiyi Zhenren. This spear contains the heat of the nine suns and can pierce the scales of a dragon. When being thrust this spear ignores armor. The magical red ribbon that Ne Zha was born with. While not seen as a weapon to mortals, the Armillary Sash is a powerful celestial weapon. 5 Meters in length this red sash can move independently of it's master, wrapping up enemies and providing support. The Armillary sash has A-Ranked Agility, and A D-Ranked Strength stat. Golden Wheels indowed with the elements of fire, and wind. Ne Zha skates through the sky with these wheels. These wheels allow fly, walk on water, and run up the sides of buildings. He's also immune to terrain based disadvantages. Ne Zha actually did become a god. In his Godly Form Ne Zha has three heads, which give him a 360 degree view of the battlefield. He also has Six arms with which to fight. Besides that His Divinity Rating Is Increased it EX-Rank. Advantages/Disadvantages: Ne Zha can only have an EX Rank in Battle continuation if their summoner Constructs a Lotus garden for Him. Which means that they'll have to use the preparation phase of the War to construct it. History: Ne Zha was carried in his mothers womb for three and a half years before she finally gave birth to him. When he was born he appeared to be a fleshy egg. Which his father immediately tried to destroy thinking that it was a demon. Out from the egg jumped A fully Grown Ne Zha who could already walk and talk. Think that the boy would be a savior the Immortal Sage Taiyi Zhenren took Ne Zha as his student and gifted him with powerful magical artifacts. During his adventures Ne Zha saved on of this freinds from a fearsome dragon. The Dragon was the son of Ao Guang the lord of the Eastern Sea. The Papa dragon was so upset at the defeat of his son that he demanded the people of Ne Zha's village turn him over otherwise they'd be destroyed by floods and Rain. Not willing to see his people suffer Ne Zha committed Suicide to placate the dragon god. His Body was given to his family, and in secret his mother built a temple to Ne Zha in a nearby forest. The shrine became popular as Ne Zha's Spirit would grant miracle cures to the sick and crippled. 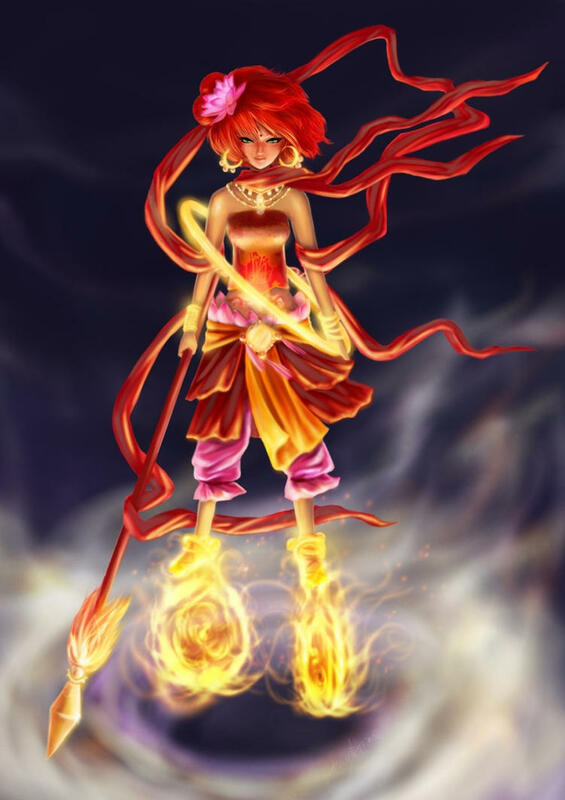 Some Time Later Ne Zha's Master reincarnated him using the parts from a Lotus Flower. With his body back in action Ne Zha became a mighty protector.